Nicolie Campbell aims to make up for lost time when he returns to the ring next month. 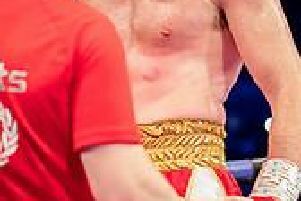 The Sheffield super middleweight hasn’t boxed for almost two years after battling a persistent knee injury. The absence has held back his promising career. But now the 26-year-old Gleadless powerhouse is ready to resume his quest to make a mark on the national boxing scene. “I damaged my right knee power lifting and wanted to give it enough time to heal so it doesn’t reoccur or plague me for the rest of my life” he said. Campbell performs on April 21 at the Platinum Suite, Bramall Lane on the undercard of the Sam O’maison v Jordan Cooke English super lightweight event. “I was due to fight at Barnsley but the show was cancelled after the death of Scott Westgarth” he said. “But now this one is on and I want to pick up where I left off. I put in a great performance in my last fight (points win over Grzegorz Semik) - I knocked him down and was strong throughout. I am just taking one fight at a time as there is never anything concrete in boxing. “I want to be busy - four or five fights in a year, so we’ll see what happens” said Campbell W3 L1, who expects to take on a yet-to-be named Polish opponent at the Lane. Campbell, a fan of Floyd Mayweather and Adrien Broner is currently trained by Reagan Denton at De Hood at Manor Top. He says his style is ‘come-forward’ when he needs to but relies primarily on an elusive style which prevent him getting hurt.